In many youth programs--in much of life, for that matter--we can have a tendency to focus on what's wrong. Humans are natural problem-finders and we are usually scanning our horizons for things that need to be fixed or changed. Research has found, though, that we are actually at our best when we are focused on the positive, on what we want MORE of, not less of. David L. Cooperrider and Dianna Whitney have developed a model for seeking out the best in people and situations that has proven extremely effective in creating positive changes. 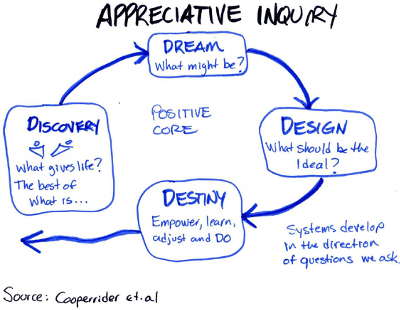 This model is called Appreciative Inquiry and it's something we can use in our work with students. Discovery--finding out "what gives life?" This is the best of what is--helping people discover what's working and what gives energy and life to a situation. Dream--What could be? This is about imagining opportunities for the future. Design--What should be? What plan can we create to achieve the dream? Destiny--Creating, learning from and adjusting our plans. We ask questions in each phase of the process, recognizing that what we do develops in the direction of the questions we ask. If we ask "negative" questions at each step (What's wrong? What needs to be fixed? How do we avoid these problems?) then we end up creating negative systems. By focusing on positive questions, we achieve more positive results. You'll notice that in the center of this process is "the Positive Core." When we are working with appreciative inquiry, we are looking to focus on some positive issue or question. In working with students, for example, we might be working with "How do we do our best work?" or "How can we create the best environment for learning?" We can use Appreciative Interviews as a way to help young people address each of the different phases of the AI model, as they look to explore what "gives life" for them and where they feel positive energy. AI interviews can be done as an interaction between an adult facilitator and an individual student, or students can be paired up and do the interviews with each other. Tell me about a time when you felt like learning came easily to you--when you felt like you were learning something new and it didn't seem to require a lot of effort. What was happening then? What was your environment or situation like? What helps you feel energized and excited about learning something? What kinds of people and/or environments give you that feeling? What ideas do you have about how we could bring more of these things into our classroom and work together? 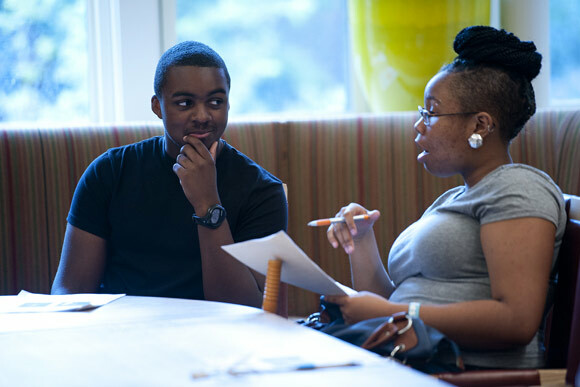 If you have students working in pairs, it can be helpful to have them each respond to the questions and then for the teams to share what they've learned about each other with the rest of the group. This can create a powerfully positive dynamic and learning. This is also a process that organizations can use to improve their own experiences and work. Try it out with staff! Appreciative Inquiry--Asking Powerful Questions--a good guide to crafting questions.